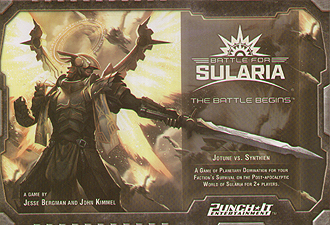 Battle for Sularia is a strategic card game in which two or more players command their chosen faction against each other in a battle for survival. As a player, you take on the role of a battle commander on the planet of Solaria - a world ravaged by the cataclysmic event known as the Fracture. Each battle commander must increase their influence in order to establish new sites, which in turn can be used to refine new sources of sularium - the most precious and powerful resource on the planet – to fuel their faction to victory. In the Battle Begins, the choice is yours. Play as the mighty Jotune, the self-proclaimed gods of Sulaira, or their own cunning mechanical creation known as the Sythien. As a Battle Card System game, each scheduled expansion will allow players to customize their existing play decks or create new ones with current or exciting new factions discovered on the planet of Sularia.